Too much humidity harms your immediate environment. Estimates suggest that the average family can produce over 11 liters of excess moisture every single day. While this affects the house in obvious ways, like mold, damp patches and spoiled surfaces, it also affects people's health in more important ways, aggravating conditions like asthma, arthritis and rheumatism. Dehumidifiers work in tandem with your heating and cooling system to maintain desired humidity levels throughout your home. Maintaining proper humidity levels in your home is essential to maintaining indoor comfort during the summer months. Lower humidity levels make you feel cooler at warmer temperatures, which means you can set your thermostat higher without sacrificing comfort. 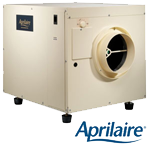 Depending on the size of your home, we offer a variety of dehumidifiers to remove the right amount of moisture from the air.